"We're holding this particular car wash for a much higher power, the almighty dollar." In the vein of the classic TV series, Candid Camera, comes Oblivious, a hidden camera game show hosted by Regan Burns. While not even close to being as funny or entertaining as the similar, non-trivia-oriented British import, Trigger Happy TV, Oblivious, after bouncing around, did manage to last for a couple of seasons on the male-targeted channel Spike TV. The concept behind the show involves Burns posing as someone he's not (a priest, auto parts store employee, etc. ), in strange situations. He finds an unsuspecting victim and proceeds to ask them a series of questions. Once the proverbial jig is up, the victim is awarded $20 for each correct answer, with a lightning round also in the mix, for another $20 per each correct answer in a 60-second time period. Of course, the main draw behind the series is the overabundance of scantily clad women that are almost always involved in the gags. These lovely ladies' appearances are justified by their responsibility for holding a "visual aid" that could land one of the contestants an extra $100, but they are really just there as window-dressing. The tone for the male-oriented aspects of Oblivious is set from the first gag in the first episode, involving Burns posing as a priest running a fundraising car wash. Of course, we know that Burns isn't really a priest, but the unsuspecting victim/contestant is drawn to the car wash by the church's members, who are actually buxom babes who don't exactly look like avid churchgoers. Once the first man, who has a great sense of humor, answers the questions correctly, he poses as the priest and draws in another man. Other skits involve a shady dentist, wackiness at a sexual harassment seminar, and the inappropriately dressed female manager at an auto parts store. The questions are unbearably easy to answer for even the dumbest of contestants, but this is basically The Man Show with trivia. The main problem is that after the first gag, the concept of the show gets very old very quickly. Sure, I wasn't complaining about the women that always showed up whose sole job was to look good, but, like the contestants, it's difficult for male viewers, let alone the contestants, to concentrate on the game show aspects at all. It doesn't help that Regan Burns is just not very funny, either. His hapless attempts at various accents and occupational impersonations all fall flat, and there are instances where he is just totally unbelievable and annoying. It's hard to imagine that Oblivious stayed on the air for even the short amount of time that it did, and I doubt we'll be hearing Regan Burns' name in the comedy circuit any time soon. Image Transfer Review: The full-frame presentation isn't bad, but it's nothing extraordinary either. Image clarity and color rendering is decent, but there is quite a bit of softness and bleeding that are major distractions. Certain sequences are overly bright as well, mostly in exterior settings, and grain is a problem as well. Audio Transfer Review: The rather lifeless Dolby Digital 2.0 serves its purpose for the most part, delivering solid, clear dialogue. Any music seems to be pushed way into the foreground, and is never a factor, but there aren't any major flaws with the overall presentation. Extras Review: The only extra is a small collection of previews for other Eagle Media DVD releases. 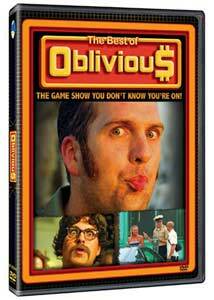 Eagle Media unleashes the ironically titled The Best of Oblivious upon the unsuspecting DVD-buying public in the form of a below average disc. The audio and video are direct ports from their original broadcasts, at best, and there isn't a single, worthwhile extra feature.